The Queen Anne table offers an antique-looking design with its ornate cabinet and machined wooden parts. The Queen Anne is similar to another Fat Cat foosball table model called the Queen Victoria. This is a great table if you are looking for something to match antique furniture or have an older home with large moldings and a lot of wooden accents. This table offers wooden handles, counterbalanced men, 10 beaded scoring system on each side of the table, and end ball returns. 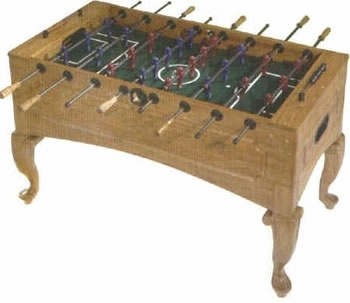 This foosball table is priced at around $650 US.